On March 11-17, 2017, a delegation of the Coptic Church visited Moscow to get acquainted with social service of the Moscow Patriarchate. The visit takes place as a part of activities of the Commission for Dialogue between the Russian Orthodox Church and the Coptic Church. The delegation includes Bishop Julius, general bishop for public, ecumenical and social services, and Ms Barbara Soliman, director of the papal office for projects and relations. On March 13, the guests had a talk with Bishop Panteleimon of Orekhovo-Zuevo, chairman of the Synodal Department for church charity and social ministry of the Russian Orthodox Church. Also attending the meeting, which was held at the Ss Martha and Mary community, were hieromonk Thomas Ava Mina, representative of the Coptic Church in Russia; hegumeness Yelisaveta (Pozdnyakova), mother superior of the community; and Mr. Sergey Alferov, a staff member of the Moscow Patriarchate’s Department for External Church Relations (DECR). 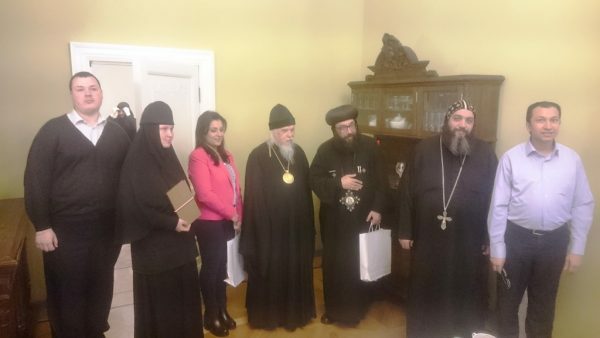 Prospects of cooperation between the Synodal department and social services of the Coptic Church for realization of common initiatives in the social sphere were outlined. That same day representatives of Pope and Patriarch Tawadros II visited the DECR. With the blessing of its chairman, Metropolitan Hilarion of Volokolamsk, Bishop Julius and Ms Soliman were greeted by hieromonk Stefan (Igumnov), DECR secretary for inter-Christian relations. A wide range of issues of mutual interest was discussed. The delegation also visited the St. Alexius hospital, the St. Demetrius sisterhood and college for nurses, the St. Spyridon almhouse and the St. Sophia children’s home, the Cathedral of Christ the Saviour, and the stavropegic Convent of the Intercession. 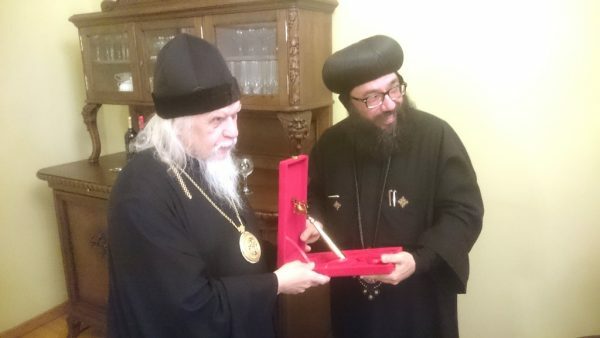 On the last day of their visit, Bishop Julius and Ms Soliman were received by Bishop Gennady of Kaskelen, the co-chairman of the Commission for Dialogue between the Russian Orthodox Church and the Coptic Church. Discussed at the meeting, which took place at the Moscow representation of the Metropolitan area of the Russian Orthodox Church in the Republic of Kazakhstan, were various directions of the Commission’s activity.